Bruno Mars is one of the hottest pop sensations in recent years; not only because of his own hit songs, but also for the hit songs he’s written for some of the most popular acts in music today. His musical style infuses modern pop with rock, hip hop, R&B, and reggae, and a smooth voice and laid-back lyrics have made him a favorite among men and women alike. During a brief stint at Motown Records, Mars met songwriter Philip Lawrence and engineer Ari Levine and the three formed a songwriting group called The Smeezingtons. Lawrence introduced Bruno Mars to Atlantic manager Aaron Bay-Schuck, who hired the Smeezingtons to write for the label. 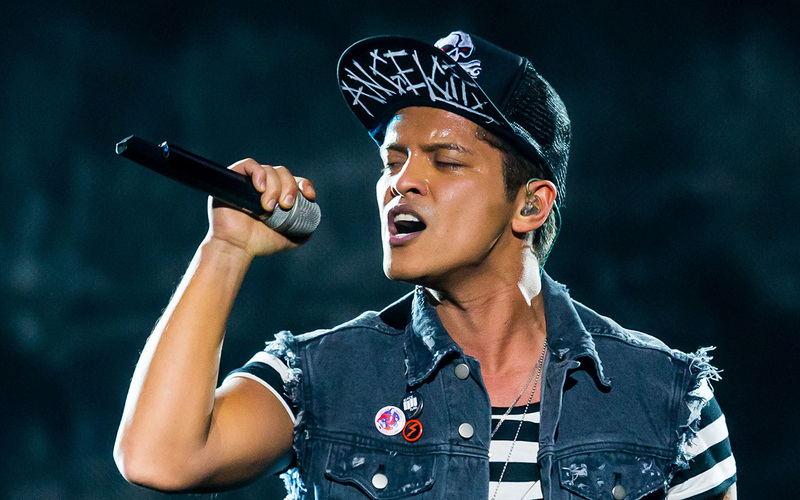 During this period of songwriting, Bruno Mars not only cultivated his personal sound but also co-wrote hit songs including “Right Round” by Flo Rida and “F*** You” by Cee-lo Green. After releasing his EP, It’s Better if You Don’t Understand (which received fair reviews), Bruno Mars exploded on the music scene with his debut album, Doo-Wops & Hooligans. It featured the hit singles “Just the Way You Are” and “Grenade”, which can still be heard playing on radios and in commercials. “Just the Way You Are” also earned him a Grammy for Best Male Pop Vocal Performance at the 2011 Grammy Awards.